dgrid is a next-generation grid component that takes full advantage of modern browsers and object stores. Lightweight, modular, and easily extensible, dgrid is released under the same open-source license and CLA as the Dojo Toolkit. dgrid 1.2.1 is now available, including bug fixes and scrolling improvements for the Tree extension! Explore dgrid's features in this app built with dgrid, for dgrid. A fast, iTunes-inspired layout using multiple dgrids. Rows expand to show more details when clicked. A simple To-Do list example. dgrid has been designed to take advantage of AMD with granular dependencies; this means it only loads the bare essentials. Use declare to create a custom constructor to add features such as in-cell editing and row or cell selection. 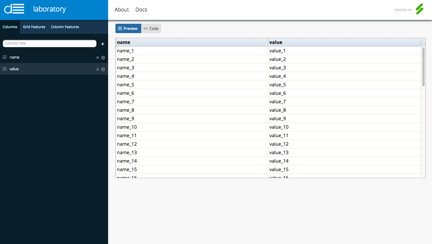 Resizable columns, column reordering, pagination and more are achieved through dgrid extensions. Or easily create your own extensions to meet your specific needs. dgrid ships with several default themes including the Claro theme to match the popular Dijit theme. You can easily customize dgrid through well documented CSS and/or jQuery ThemeRoller classes. dgrid has been tested to work on iOS and Android browsers, providing efficient rendering for your data on the go. The Keyboard mixin adds keyboard handling functionality. The arrow keys can be used to navigate the focus across cells and rows, providing accessibility and ease of use. Not ready for 1.0 yet? We still have tutorials for 0.3 and 0.4 too! Documentation: Documentation for each release is available under the doc folder. Tests: dgrid includes a set of test files that may be useful for exploring its features. Whether you're starting a grid implementation from scratch, migrating from a DojoX grid to dgrid or you just want support for your team while they do the heavy lifting, SitePen is ready to share its expertise and make your project a success. Found a bug with dgrid? Have a suggestion? Let us know by filing an issue. Have a question? Get help via StackOverflow, #dojo on freenode IRC, or the dojo mailing list. The limitations of Dojo DataGrid and EnhancedGrid are well known to our customers and the Dojo community. For years, we worked to overcome the impossible with masterful code to push the limits of these grids, all the while recognizing the need for a real solution. To that end, we've created dgrid, a grid that improves the way developers work with data, providing strong, maintainable code that exceeds best practices and reduces overall development costs. Learn more about SitePen. dgrid is released under the same open-source license and CLA as the Dojo Toolkit. Contributing to dgrid is easy! Just fork us on GitHub, write your patch, then submit a pull request. If you've never contributed to a Dojo Foundation project before, you will also need to take a moment to fill out the JS Foundation CLA.